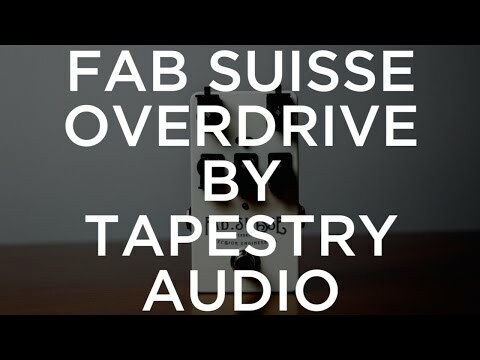 The Tapestry Audio Fab Suisse Overdrive pedal. FREE shipping in the USA! The Fab Suisse is a small overdrive with amazing vintage tones. Since this pedal is built around the classic Blues Breaker circuit and a 3 band EQ, it is a low headroom pedal that you get to push to 10. The circuit combines the front end of a Blues Breaker along with it's diodes for soft clipping in the feedback loop of the op amp. Also, it has the "Marshall style" 3 band tone controls. Between the two sections, there are LEDs in hard clipping mode which produce more of an open sound with more headroom and less compression, and also a soft clipping mode. The toggle switch, being and on/off/on, enables the clipping elements to be disconnected from the circuit altogether, giving a third option which is no clipping mode or boost. This mode has the most headroom out of the three with the distortion coming out of the op amp by itself.